Please note that beans present a choking hazard for young children. Raw uncooked beans, if ingested, can cause discomfort. This activity is not intended for children who are still putting things in their mouths. Please provide constant supervision during this activity. Dried Beans are one of our favorite sensory materials around here, so when I saw this post on Coloring Lima Beans from Praying for Parker I was super excited - I'd never thought to color them before! One of the things we really adore around here is super bright vibrant colors - and I wanted to see if I could find a way that would color the beans more fully than the method used by Praying for Parker. Though the ultimate answer was pretty simple, it took a LOT of tries to get it just right. I couldn't resist a few shots of the full rainbow before the kids dug in. Post children. Still beautiful, though! I think they look a bit like jellybeans, hahaha! The kids had fun just playing and running their fingers and toes through the beans. Then they decided they'd like some cooking supplies and set to work cooking each other a variety of things. I'd remembered Fun A Day's post on coloring corn kernels and that she had the same problem initially - she couldn't get the kernels fully saturated with color. I used the method she outlined, and though it did brightly color the beans, the skins sloughed off. Well, shoot. I tested both liquid watercolors and food coloring and with and without vinegar and with a variety of soaking times and only one method yielded beautiful beans every time. So here's how to do it. Buy a lot of beans - any lightly colored bean will do. Lima beans, white navy beans (what we used here), even pinto beans (you can usually score big bags of pintos at the Dollar Tree!). Measure a cup of beans into a container. We used a tupperware (Gladware) container, but a bag would probably also work. 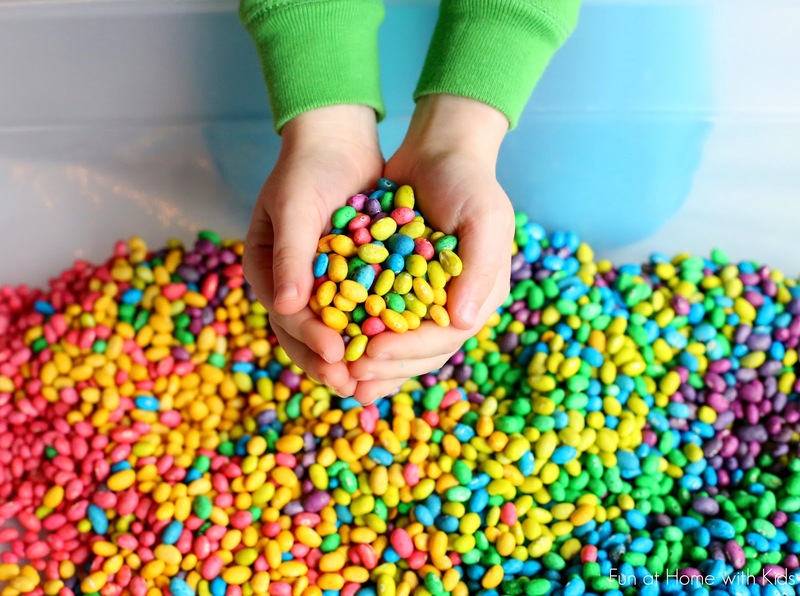 Add one cup of beans and 15 drops of whatever food coloring (food dye) color you wish. To get the rainbow of colors you see here I used a combination of regular food coloring and neon food coloring . Unfortunately, for once, liquid watercolors did not work as well as food coloring! Once you add the 15 drops, close the lid or seal the bag (add some air if you're using a bag) and shake them like crazy for about 10-20 seconds - until you see that they are completely coated. Immediately dump them out onto a paper towel or paper towel lined tray and spread them out evenly so they are not clumped together (see below). Allow them to air dry for several hours. The beans will last for several months, if not longer, so long as they are kept dry. We've had ours for about 3 months now and they are just as bright and vibrant as ever. We keep them in a plastic shoe storage box when we're not playing with them. Asia I LOVE this one. Such wonderful colors!!! How fun! Totally going to have to try it. And FYI we've used our beans (pinto mixed with random bags of other kinds) for for years (undyed though), our rainbow rice has lasted a few too. The key for us is putting the away bone dry. Thank you, Amber!!! I knew it would be right up your alley since we both have a deep love of rainbow rice! :) That's awesome! I think we've had our rainbow rice for a year now and it's perfect still! Oh they are sooo bright! We have found that when we color rice the color comes off as dust, does this happen with the colored beans? Oh, interesting! No - no dust so far, but we've only had them three months. I suspect that the rice crumbles a bit more easily than beans and that may be what causes the dust? Does the food coloring come off on their hands while playing with them? awesome!! Do they stain finger at all or are they totally stainless once dry? I have same question. Because with playdhough we have some bad experience with food colouring. I love the rainbow beans! This is an awesome idea! I must share it. I can think of all the sensory fun and maybe collage fun as well. Thank you, Art Mom!!! Yes, we love making art with them as well. Bean mosaics are way fun! Yes they do look like jelly beans! Gorgeous! Thank you for doing all the work and trial and error so we don't have to. Hi...oh, this is so pretty! (0: Just curious, in your rainbow picture...is that just one cup of beans/color or did you make more than one cup of each color? Thank you! These are AWESOME! You are right about them looking like jelly beans. 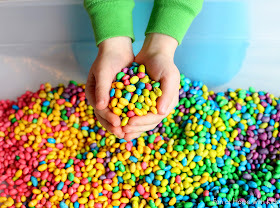 What great filler for an Easter sensory bin. So fun! I'm totally going to buy beans next trip to the store. This is too fun to not do. ooooh lovely. I hadn't thought of colouring bean s before. Thank you, The Monko! We think they are so fun colored! Revolutionary, gorgeous, and phenomenal as always! So just the food coloring made them this vibrant?! Wow! I'm impressed! I colored rice before and I had to use rubbing alcohol. I'm going to have to try it now with just the food coloring. These look amazing! I colour rice with food colouring doing more or less what you suggest above (I stir mine rather thank shaking it) and it works just fine. I use it for an activity with students at the beginning of each year, and the leftover rice from the previous year is still OK the following year as long as you make sure it is dry before putting a lid on it. Yeah the vinegar doesn't do much in that regard. Wet vinegar rice will still mold. The key is keeping it dry, like you say Judy! I am in love with this! I am actually wondering why I hadn't tried to color beans already myself. Thanks for the great idea! Thank you!! We think they're a fun change up from our rice (which we also love). This is awesome. I'm always looking for interesting ideas to keep my little one occupied. I had forgotten about using an under-the-bed storage box - I did that years ago with my older one and sand. Yes those underbed storage boxes are just perfect, right? So fun to have a little sandbox!!! While they look so pleasing and feel so good to the touch, I have a moral dilemma when it comes to using (so much) food in play. It feels uncomfortable to me to use food when lots of folks around the world would be ever so grateful to have a meal of those beans. Using food like that is not the message I want kids to have. There are many other eco-friendly ways to play without wasting food. Do you realize food wastage, water-shortage, starvation and malnutrition are global issues people in other parts of the world face everyday? Please learn to cherish food because not everyone has a chance to even see so many beans in their entire life. Agreed these are major problems. However, as a side note, in many of these countries corruption is huge part of the problem, with everyone from government officials to the person distributing government subsidized rations lining their pockets with bribes and cheating wher they can. We live in the third world and see this firsthand. Everyone will have to wrestle with this one themselves, but i just want to point out that so much of this is institutional and societal corruption. One way to get past it with beans is to skip coloring them. 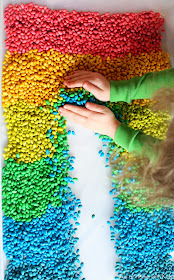 Let the kids play with beans on an old bed sheet and then reuse them--rinse well and cook. We play with whatever batch of beans we have in the pantry at the time. Also I wanted to tell you that I live in a third world nation and teachers make little bean bags for sensory play in preschool. You can use food for not eating purposes as long as you DO have a purpose and you're not wasting great amounts of food, and it also helps if it's cheap. You're not gonna use caviar for sensory play. I'm sure you could cook and eat the beans, though I'm not sure that the food coloring would be so good to ingest. I'm also not sure how much would boil off as they cooked. If the color stuck around it would be super pretty though! And that's very helpful to hear - I like having my kids play with natural items over manmade plastics, etc, and we still have these beans years later. We definitely mean no offense to those who don't have enough to eat. What a lovely blog! I can't wait to try this with my grandson! Thank you! that's so strange, I tried to dye beans with food colouring on the weekend and was so excited how they look, but it's be 4 days and the dye still comes off on dry hands. Wish I knew why because this is a great idea. Thankfully the kids still really love playing with the plain beans! Maybe I should try a different kind of beans? Do some have a wax coating maybe or something? Hmmm, very interesting! I don't know - it's possible that they might? Ours are totally fine and we've used them a bunch over the past few months and never had trouble. What kind of beans were they? What brand of food coloring? I'm not sure if either would have an effect, but possibly it's one of those? So sorry it didn't work!!!! Could you let me know which food coloring you used for your beans? I used Adams Extract because that was the only one that was in stock when I was at the store. Besides McCormick what other brands have you used? The Dollar Tree brand (I can't remember if there is a brand name? But the kind you find at the Dollar Tree) and Kroeger brand. A friend child died after choking on a bean,the bean swelled in her wind pipe. I have colored rice before and baked it in the oven for about an hour at 175-200 to help dry it out more. Do you think that would work with the beans? I'm so sorry I forgot to respond to this!!! Hmm, I'm really not sure - it might, but it also may dry the beans so much that they split and/or the skins peel? If you try it out and it works, let us know! J'aime votre arc! 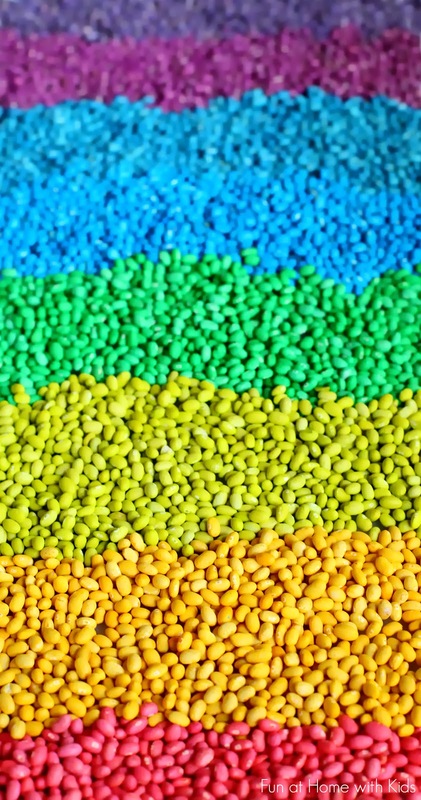 Comment drôle - avez-vous utilisé la même quantité de colorant alimentaire? Je me demande si notre colorant alimentaire est plus fort? Ils font une très belle couleur pastel et j'aime la façon dont vous les avez utilisés. Merci pour relier!! 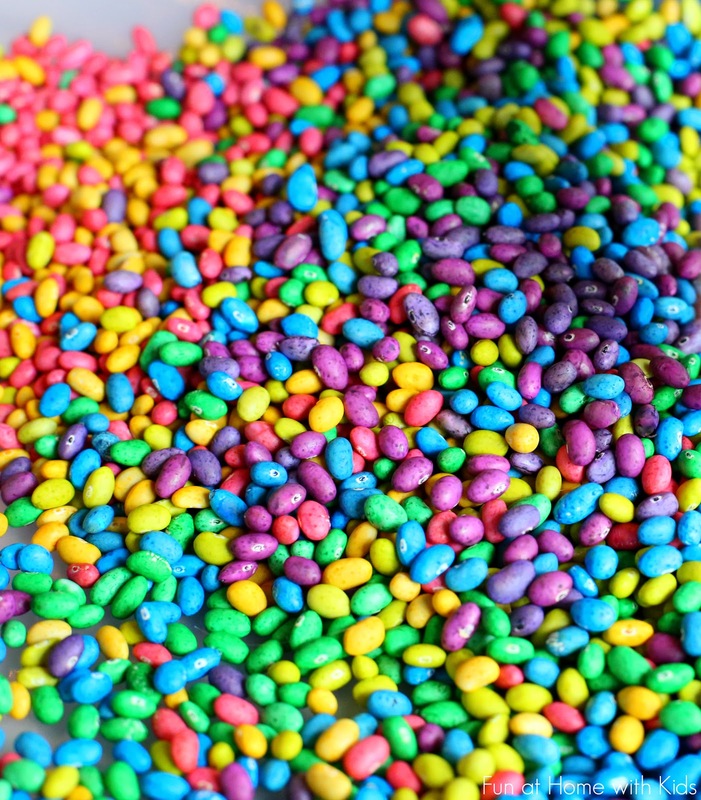 Do you mix food colors to change the beans into the different colors? I can only find 4 food colors at our store!! You definitely can, Tiffany! I used one set of regular food colors and one set of McCormick Neon colors to get all of the colors you see here. As for the moral dilemma person. I am sure their conscious can be lifted if for every bag of beans they color for a child's pleasure and sensory experience, this person can send the same amount to a country in need. Sadly- more food is wasted in children's breakfast programs than any simple food related sensory play for a child. As a preschool teacher.. THANK YOU for a great post. Oh, how gorgeous!! My now-4-year-old LOVED playing with the beans at "school" so much that she got 10 lbs of pinto beans for Christmas... and she has played with them more than any other toy ever!! She played with them pretty much every day for 4 months, pouring and scooping and pretending to cook with them. Unfortunately, Mom got tired of stepping on spilled beans that didn't get picked up so they're out of reach for the time being... but part of the problem was that the pinto beans blend in very well with our carpet, so bright colors might actually help! Thanks for sharing!! Awesome!!! Yes, the pintos looked like leopard beans when I colored them - super fun! And hahaha - I could see that - they naturally are the perfect carpet color!!! What kind of activities do you use these beans for? So glad I found your post! These will look awesome in my sensory table for my kinders! Thank you! Mi doubt is, isnt it dangerous for the kids?, i mean in case of ingestion arent them too little? Great colors love them. Thank you for posting this! How FUN. gonna try it tomorrow :) Have you ever cooked the beans to eat too? Thought it would be fun to eat colored beans... we eat food coloring in food right?? shouldn't be an issue. I just wonder if it will hold the color when cooked ;))???? Hmm, I'm not sure! It probably would, though it's a lot of food coloring to eat, which probably isn't the healthiest.... :/ It sure would be pretty though!!! I have dyed ditalini and other pastas much in the same way, you don't need as much food coloring ( you can add more drops as you go along until the pasta is fully drenched in hue)...and then we string the colorful pastas. We like the ditalini best because it looks like beads. It's great to teach patterns with children. I did this and it came out mottled...any ideas? I used silver spoon food colouring liquid. My beans came out lovely but remained very sticky. I realize I used gel food coloring, which is all I could find. Is liquid food coloring different from gel? Yes, unfortunately! :( It has corn syrup in it (gel food coloring), so it is often sticker - especially in the case of the beans, which is a bummer because the colors are so beautiful. They aren't sticky when you use regular liquid food coloring. I always feel like a failed craft is such a tragedy lol! Oh no! :( :( :( So sorry! I found the solution to sticky beans. I, too, used the gel dye. My beans were sticky even after 24 hours. I baked them in the oven at 200 degrees for about an hour. Still sticky (but a little better). So I rubbed corn starch on my hands and ran them through the beans. Each time I added more corn starch to my hands, the beans became less sticky. Now they're only sticky if I squeeze the beans. I keep rubbing my hands with corn starch and running them through the beans. They are no longer sticky. I think I'll have my grandchildren rub their hands with corn starch before they play with them. Made these this week with my kids, ages 7, 4 and 2. They were all able to help with every step of the process, which is important to me when I look for crafts and activities for them. We used pinto beans and McCormick food coloring. I love the richer colors the pintos produced being brown underneath. The kids about drove me nuts waiting a day to play with them, so they were very excited to dive in when I told them it was time. They used some bowls, spoons and plastic eggs from the play food. The beans held my two oldest kids' attention longest, perhaps an hour. Thanks for the tutorial! So glad you all enjoyed them! I agree - the pintos look like leopard beans or some sort of exotic creature with the color over them! I am curious, without the vinegar the food coloring sticks and doesn't rub off on the skin? Correct! Unless you use gel food coloring instead of the normal liquid food coloring OR unless you handle them with wet hands. Though if you handle vinegar-dyed beans with wet hands, the coloring will also come off. Thank you for this great idea. I live in the UK and the colours you use are not available here. I attempted the beans using the food dye you get in the supermarkets here, but they turned out oily and wouldn't dry. I wasted masses of beans, tried drying them by the fire and in a low oven but still they remained oily and wet. I also tried expensive paste dye and gel dye, but still it didn't work. Eventually I ordered the McCormick dyes from America, at great postage cost (not available anywhere here). Wahey, it worked! They look great, but were expensive in the end! Also I think you need far more emphasis on your website/ book about the precaution of full adult supervision, as it is a known fact that if you were to eat just one of these raw beans you would experience a lot of pain, bloating and maybe vomiting - they are poisonous. I know, as mum ate one a while back! Oh I'm so sorry the food coloring was such a headache for you! I have no way of testing UK food dyes, so I had no idea. I wonder what it is that is so different between the two? Do the colors come off if wet? Like if a child trys to eat them or if they were to accidently get wet? Aw, bummer! There is that brown to compete with underneath. 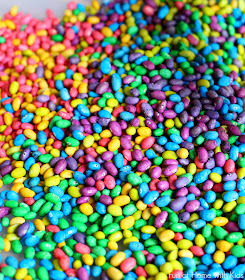 We used the white navy beans for the photos for the crispest, brightest colors. Great idea! My son will love this. I will dump them in the (empty) water table on those cooler days. Thanks!! It sounds like you may have used gel food coloring. You have to use the regular liquid kind for it to work. Is it JUST 15 drops of food coloring? These are so gorgeous! I'm so glad that I came across your article because I had trouble coloring our pinto beans, but now I see that I should have added more drops! Thank you so much for the detailed instructions!